fully intended to share all the bits as I got her nursery ready, then we got a call saying she'd be induced a week early. So, we kicked it into high gear and didn't quite finish in time with all the little things we needed to do before our baby girl came. I spent a few days after we brought her home adding a few butterflies to girl it up, we kept her nursery very neutral until she came home. Doctors have been known to make mistakes. For three months I was home with her, with every intention to begin blogging again. However, everything I could think of to write about was "baby, baby, baby"... I don't really want to be a "mommy blogger", it doesn't really fit with what my blogs theme and goals are. If, however, I'm not writing at all, that's not much of a blog either. Right now, my life revolves around my baby girl, and sorting and organizing the massive amounts of stuff she seems to require. I'm going to give in and do a bit of an organizing for baby series to get all these topics and bits out of my head and be able to move back to more adult topics as well. They'll start in August, in the meantime, I'll share a bit about my baby girl. I'll start with a question for you, when you blog about your children, do you use their real names or a psuedonym? I have a nickname for my daughter, but I doubt it will fit her indefinitely. I also wonder if I should keep it to a psyuedonym for her privacy once school starts and friends possibly searching her name online. 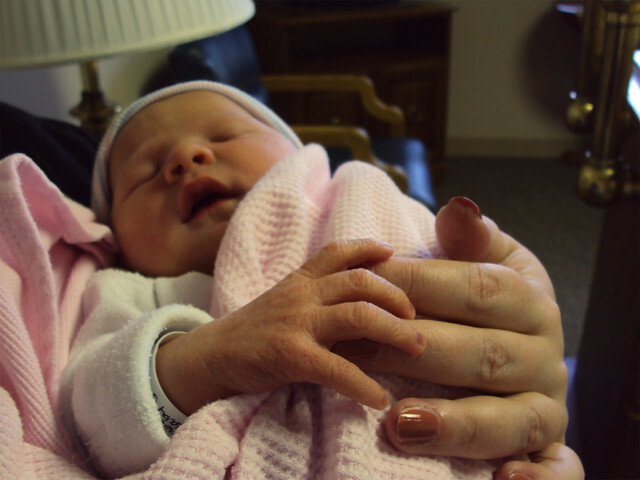 Here's a pic from the day she was born, her fingers were so tiny, yet so long. She was born on "tax day", April 15, and was a little peanut, just 6 lbs 11 oz and 18.5 inches. Today people guess that she is 6-8 weeks vs the 14 weeks that she actually is. 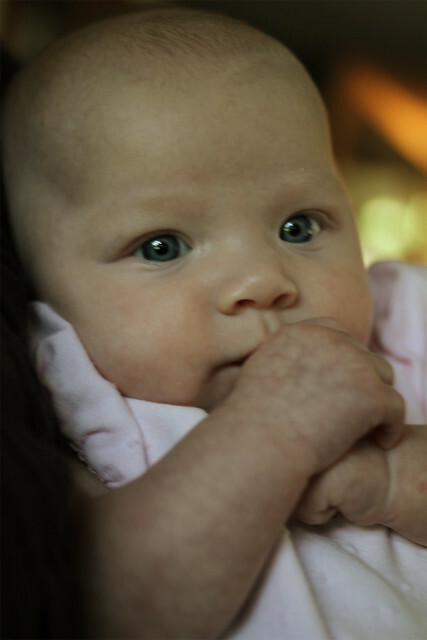 She has light brown/dark blonde hair and blue eyes, and is the prettiest baby I've ever seen. Of course I'm biased, but I'm terribly smitten with her and count my blessings every day that she's in my life. I went back to work 2 weeks ago full-time, and every day is a struggle. However, that's what I need to do for our family right now. I'm a full-time working mom, but in the interest of full disclosure... something had to give. That's right, I can't do it all and I have the utmost respect for those who can. I have a lovely woman who comes to my house once a week to vacuum, dust, clean my bathrooms and kitchen counters. Maybe one day I can go back to trying to do it all, but for now I had to give up something and was more than happy to give up the cleaning aspect of housework. Yes, I write a blog that has a heavy focus on homemaking, and I gave up the house cleaning. I still have to keep an organized picked-up (mostly) house to make it as easy as possible for her. I'll still have to do Spring Cleaning and Fall Cleaning and yardwork and have plenty of things to write about. However, toilet bowl cleaner will no longer be something I'll be making a recommendation for, not that I did before. I hear you on being "mommy blogger" - I've always fought that moniker - and yet I do blog about my kids. I never used pseudonyms until I started blogging locally in my own city and realized that with very little work someone could track me (or my kids) down and didn't want it to get weird. Being a crafty blogger, I rarely have weirdos comment, but it's happened once or twice and I've been happy to keep the anonymity. Gorgeous baby! And we all understand taking tons of time for baby! Welcome back! I missed you. She's beautiful! It will be a struggle for balance for awhile, but for ALL the right reasons! As long as you go back to blogging, I don't care what you blog about! That said, my blog posts have been very few and far between over the last year. I need to get back into the swing again. P.S. I have weirdos every now and then pop up on my blog. It's the adoption thing. Some folks are VERY against it, and don't mind sharing their ignorance and hatefulness with others. I just delete and move on. I was thrilled to see the email notification that you had posted. I too have missed you and am delighted to read about and see your beautiful daughter (yes you are biased and you are right at the same time!) Congratulations to you and your husband. Although I too have been blogging intermittently, my head is full of ideas I'd like to post. We'll see how that works with baby number 4 due (actually, he's 6 days overdue today!). I use my children's real names. Every so often I do a google search and so far haven't found them popping up. The difficulty arises when friends or family use our last name in comments...I'm working on deleting those as soon as I can. And I'm with Kiy, I don't care what you write about as long as you are posting. You are a great writer and I enjoy reading your posts. Also, if you steer clear of baby posts we'll miss seeing this beautiful new person in your life grow. Do not deprive us, please! Welcome back Barbara & congratulations!! She's beautiful! I didn't want to be a money blogger either so I recently made a new one just for baby. I don't use his name when I talk about him, I say the little guy or soething, even in the mommy board I visit. Your little girl is beautiful! I am so happy for you! I will sell you whatever you would like! You can go through the archives of my shop, or if you want, cook up some new ideas, and I'll paint an original! Let me know!